Every year, significant development effort is put into GPU Acceleration of the Abaqus solver. However, the majority of published benchmarks, only highlights very large dynamics models. 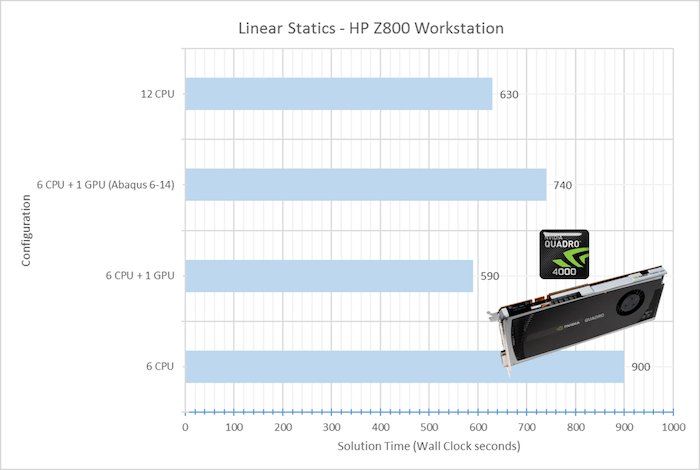 In this post, we discuss our findings in terms of performance benefits of GPU computing for a range of medium-sized problems with Abaqus 2016 as typically encountered in a Small Business Environment. Both CUDA (for NVIDIA hardware) and OpenCL (for AMD hardware) implementations of GPU Acceleration in Abaqus will be presented. These positive results and the interest this original study generated (see original article at http://tinyurl.com/tentechllc-gpu) encouraged us to explore Abaqus 2016’s GPU Computing further with different models and hardware configurations, which is the object of this document. TEN TECH LLC is an Aerospace & Defense contractor, specializing in Defense Electronics. It is no surprise that our test model would be representative of our daily activities. 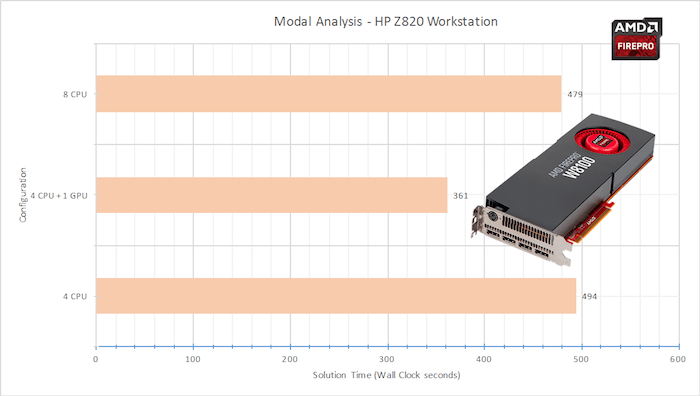 Hardware-wise, our current in-house workstations and workgroup analysis server were put to the task. To push the study a little further, we also employed the cloud-based simulation HPC solver provided by Rescale. Standard MIL-STD-810G harsh environment shock and vibration analysis as well as classic low-cycle fatigue thermal expansion analysis were selected as test cases. Three separate cases were created to test the relative benefit of GPU computing for different types of solutions: linear statics, non-linear statics and non-linear statics with surface-surface contact and friction. For problems that exceed the limits of our in-house hardware, TEN TECH LLC utilizes the Rescale ScaleX cloud-based HPC resource. This provides our engineers with an ability to run Abaqus on a large cluster available on demand. An example of our use of Abaqus on Rescale’s cluster can be found here. 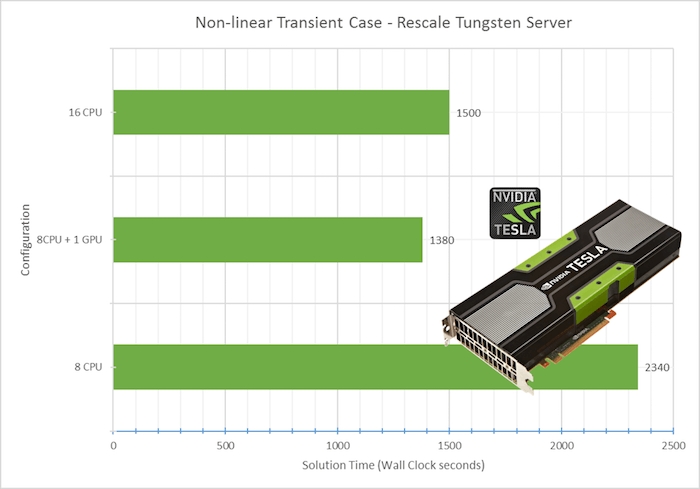 Apart from the abundance of cores and RAM available, Rescale’s “Tungsten” configuration also provides access to high-end NVIDIA Tesla GPU accelerators. Thanks to Rescale, a third hardware configuration employing a 16-core and a 32-core environment augmented by an NVIDIA Tesla K40 were utilized, to provide one more data point. All the test cases were solved using the same version of Abaqus 2016. The in-house tests were performed on Windows 10 while the Rescale cluster is using Linux. 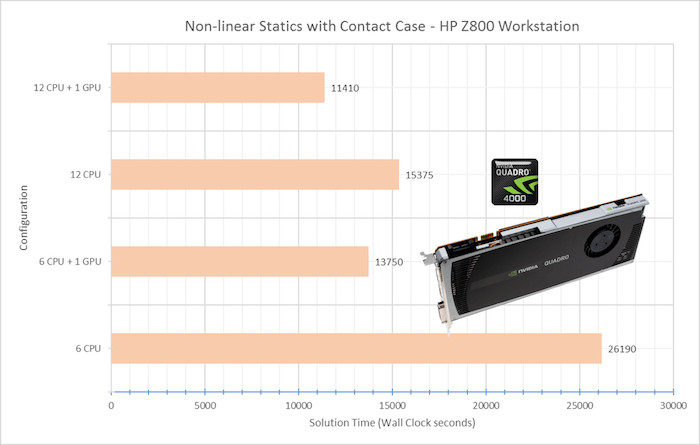 The nominal case, with 6-CPU is a short 900 s Wall Clock. Adding a GPU to the mix drops this to 590 s, a 34% improvement. Quite remarkable considering the relatively modest performance expected out of a 2010 GPU. Equally remarkable is the performance gain between Abaqus 6-14 and 2016 versions of around 20%. This alone should encourage everyone to upgrade to Abaqus 2016. On such a small problem, it seems more advantageous to run the model with a lower count of cores but with GPU as our example shows 6-core with 1 GPU solves slightly faster than with a 12-core configuration, while 12-core still brings benefit over 6-core, solving 30% faster. This second set of results doesn’t seem to be as positive as the first series of benchmark. Somewhat inexplicably, a mere 7% performance increase over a 4-core solve can be obtained while an 8-core configuration is 17% faster. But, as the number of cores increases, the benefit of GPU also increases as the GPU performance gain doubles as we double the number of cores: 14% performance increase over an 8-core solve if we add one GPU. This set of results could be greatly attributed to the fact that the Quadro K4000 does not offer full Double Precision performance. The use of GPU hardware offering full Double Precision acceleration seems to bring the results back in line with the observations of the first benchmark: an 8-core + 1-GPU configuration is 41% faster than an 8-core, and 8% faster than 16-core, while a 16-core configuration is 36% faster than its 8-core counterpart. Once more, it seems that for a medium-size problem like Case 2, GPU Computing performs very well and is more advantageous than doubling the number of cores, provided the GPU hardware can provide full Double Precision acceleration. The same trend can be observed than for Case 1 & 2: 6-core + 1-GPU performs 47% better than 6-core and 11% than 12-core. Pushing the study a little further, adding GPU to a 12-core solve still brings another 26% performance gain. In the case of a 6-CPU solve, the addition of 1 token for GPU computing saves us over 3h30min of solution time. And this is with using a $200 street price 2010 GPU! The hardware employed in our OpenCL benchmark is the AMD FirePro 8100, an 8GB DDR5 video card which offers peak performance of 4.2TFlops Single Precision and 2.1TFlops Double Precision for a $1,200 street price. Once again, we observe the same trend: using GPU acceleration on our 4-core solve is around 25% faster than with 8-core, and about 30% than the standard 4-core solve. This is on a less than 500s solution time. 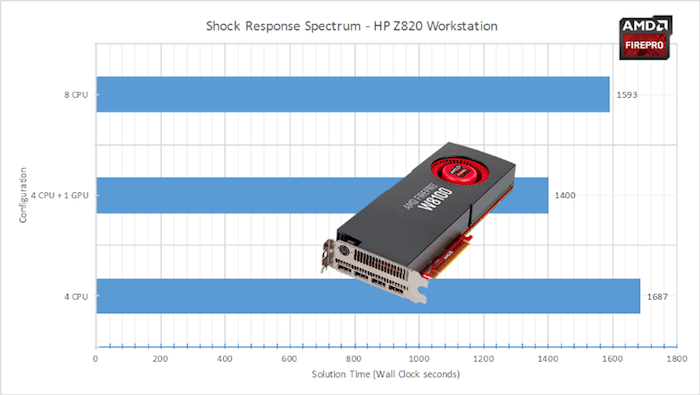 In this case, adding our AMD W8100 to the mix on a 4-core job brings us a 20% performance increase, and around 10% performance increase over the same job running on 8-core. 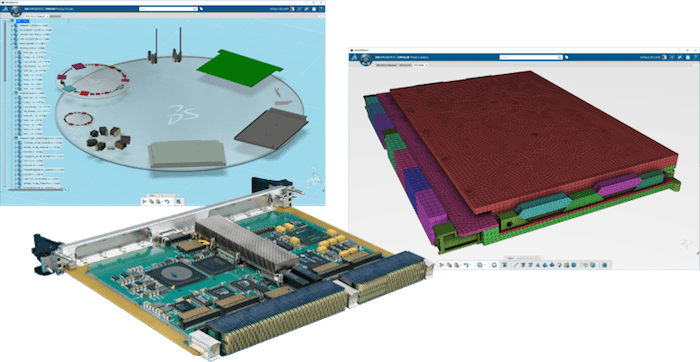 Since GPU computing consumes less tokens than adding extra cores, its inclusion in everyday Abaqus analyses will allow for greater analysis throughput and better utilization of hardware resources. 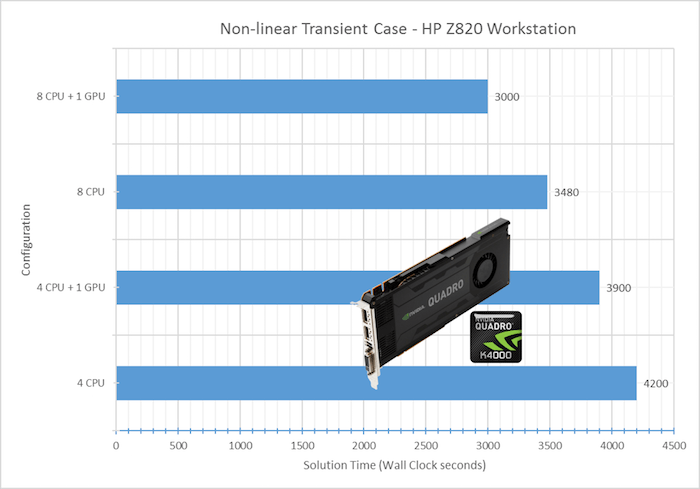 Based on our experience, the added throughput provided by GPU computing in our environment allows us for an ROI on adding a GPU computing Abaqus Token and the GPU hardware from NVIDIA or AMD of less than a month.